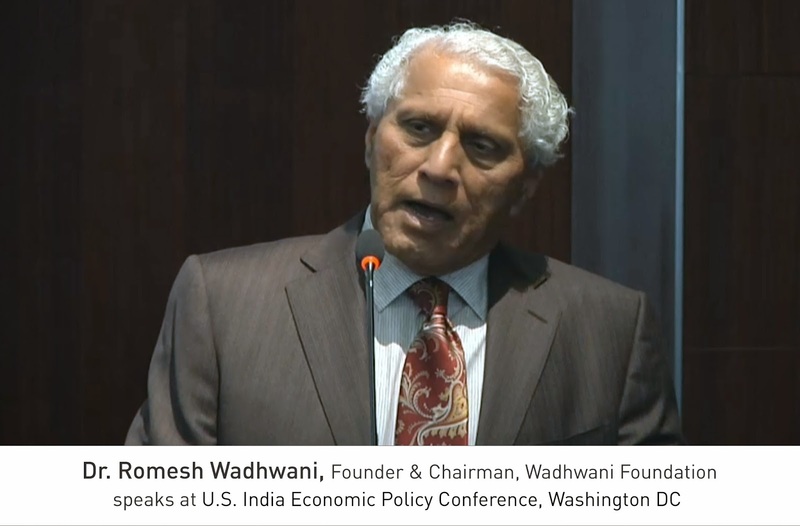 Washington, D.C, 16thApril 2015: Today, the Center for Strategic and International Studies, the Wadhwani Foundation, and the Ananta Centre organized an economic conference to assess some of the emerging areas of bilateral economic engagement. The conference brought together critical experts, both inside and outside of government, to look at the scope for cooperation in key initiatives such as “Make in India,” “Smart Cities,” and “Instilling Skills for Growth”.Business and government leaders provided perspective on India’s business environment, the changes since Prime Minister Narendra Modi took office, and what policy reforms are necessary to unlock greater trade and investment. 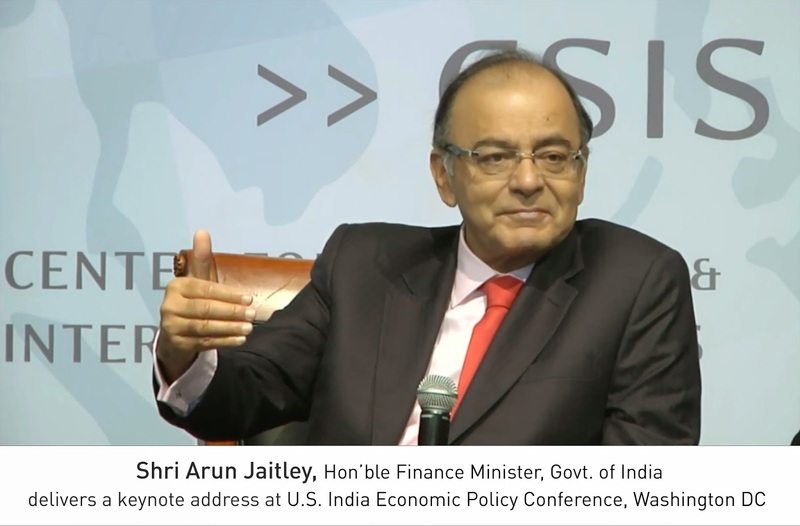 The event concluded with the first U.S. address by Finance Minister Arun Jaitley since his government took office last year. Delivering a keynote address at the conference, Shri. Arun Jaitley, India’s Finance Minister said, “Our emphasis is on manufacturing because that’s where the jobs are going to be. The roadmap that Govt. has laid for itself is to open the door for investment. Recently we have taken the steps of opening up the defence, insurance, real estate, mining, coal and railway infrastructure and the next stage is to ease up our systems and taxation so that investing in India becomes more attractive. I am reasonably confident that these developments in manufacturing and infrastructure will lead to a double digit growth in coming years, from a projected 8% growth this year. Also, our skill development programme has just started and it’s the success of this program which will take us in the direction of generating a huge workforce with a large potential for employment”. Other speakers noted the strengthening of bilateral ties between the U.S. and India following the Narendra Modi-led NDA government’s victory in May 2014 and discussed the steps taken to increase market access for foreign firms, specifically by increasing foreign equity caps in sectors including defence, insurance, pensions, and railways. Also highlighted was the level of foreign investment into India increasing steadily amid the two governments’ pledge to increase bilateral trade five-fold to $500 billion. 1. Find areas for commercial collaboration. 2. Highlight and undertake related reforms to unlock collaborations in these areas. 3. Facilitate the resultant trade and investment opportunities. Other topics included India’s manufacturing competitiveness, the influence of state-level politics, and the role of the private sector in financing and delivering sustainable urban development. The Chair is a leading bi-partisan policy “think tank” in Washington, D.C, aiming to accelerate India U.S. economic activities. Given India’s growth potential and demographic dividend, both India and U.S stand to benefit by a focused policy initiative that drives economy-oriented reforms. Impacting policies to accelerate India-U.S economic activity is a key focus area for the Chair, by way of a shared vision and a policy framework for economic acceleration.